NSDA-Taiwan has been approved on January 5, 2017, by Scott Wunn, the Director of NSDA, and this event will happen this year! Thank you all for helping! If you are one of the schools who has signed up, your continued commitment is critical to all of us. We cannot have this event without you, so please don’t quit on us. Thank you! With your help, ADL is organizing 2017 NSDA Taiwan. 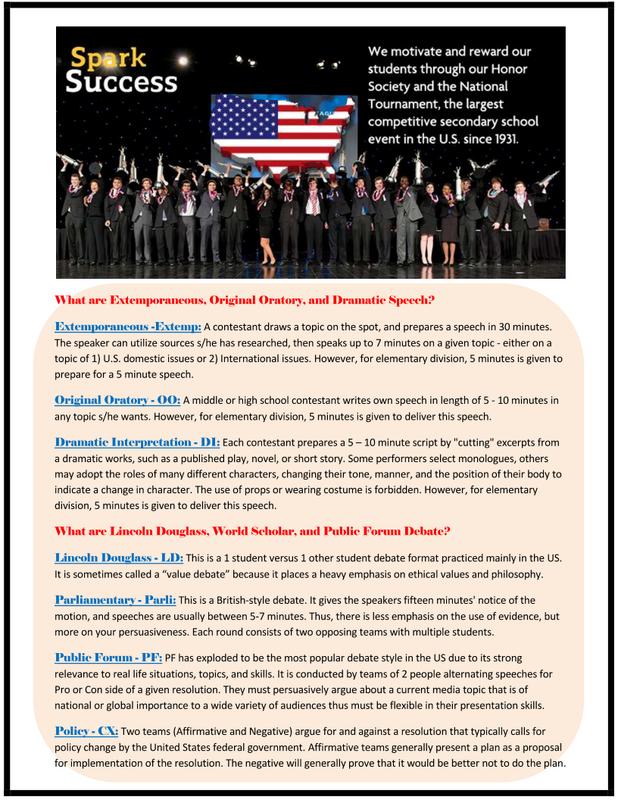 The US National Speech and Debate Association (NSDA) is the oldest, biggest, and most recognized in the world, thus most beneficial for your future College Admissions. 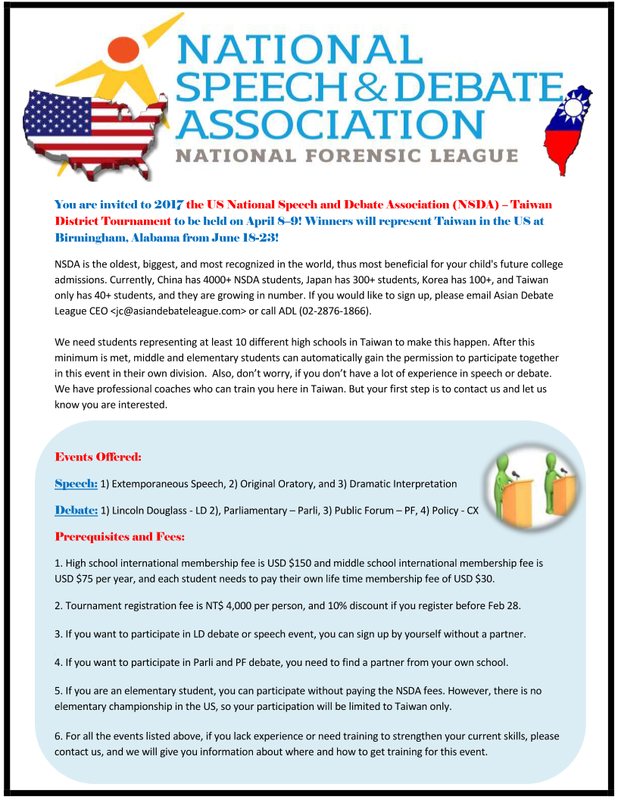 We need students representing 10 different high schools – not middle, nor elementary, but high schools – to organize NSDA Taiwan. Actually last couple of years NSDA wanted us to find 10 schools, but we couldn’t, so we couldn’t host the NSDA for the past two years. By April 2017, if we can find 10 schools, for each event (either debate event or speech event), we need a minimum of 2 teams competing each other. This means we just need either 1 debate team or 1 speech student from each school. After this minimum is met, elementary and middle school students can also automatically participate together because we plan to have 3 divisions for this event – elementary, middle, and high school. Therefore, if any high school student (by extension any middle or elementary school student) is interested and would like to participate, s/he actually doesn’t have to participate in debate, but something as simple as “speech.” Thus, it won’t be a lot of pressure for even the inexperienced, new students to compete in this event. Q: Can students from different schools be partners? No, if you are a high school student, and wants to participate in debate, you must find a partner from your own school; If you cannot find a partner, then do it alone. 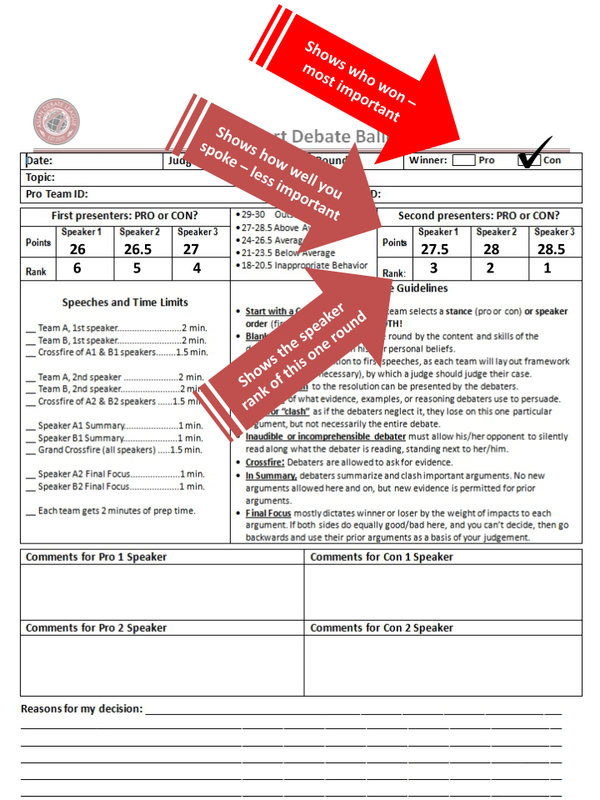 LD debate is a one person debate, so you can do it separately, representing your own school. Or, you can do speech, which is a one person event. However, if you are elementary, since there is no US tournament for kids younger than grade 6, you can be partner with anyone from different schools. Q: What happens if I debate with a partner from a different school? ADL allows debate teams with different schools, but even if you win, you cannot be qualified to go to the US in June representing your school. So, if your ultimate goal is to go to the US Nationals, then it is better to find a partner from the same school. So, if you cannot find a partner from your school, then consider doing LD by yourself. Q: How many teams are selected to go to the US representing Taiwan? For high school students – the top 2 teams from each event can go. 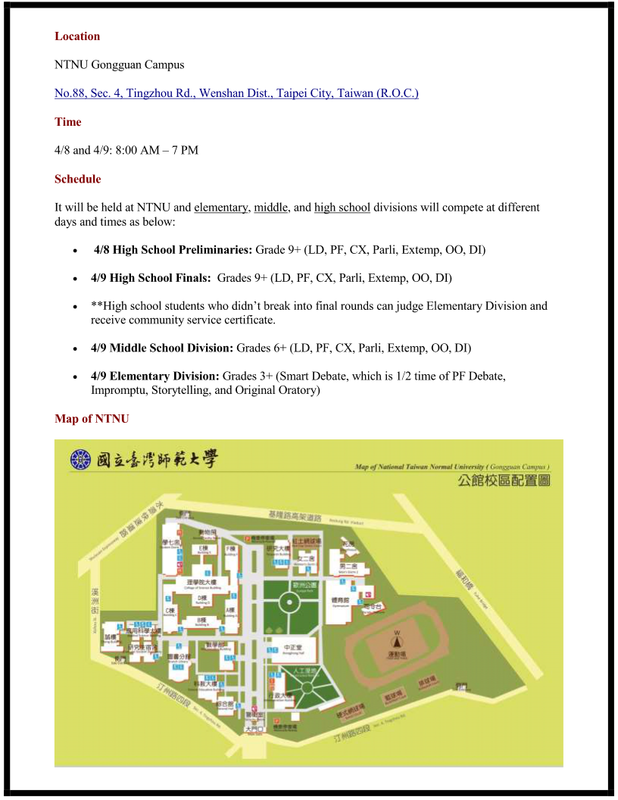 For middle school students – any team with a same school partners, even if you lose in Taiwan, can go. For elementary school students – no one can go. Q: When and where is NSDA Championship held? Q: How can I receive training for this event? Your school speech or debate coach can teach you. Q: What if my school doesn’t have a speech or debate coach? How can I receive training for this event? If you live near ADL (Tianmu, Taipei) – come to ADL. If you live far from ADL – you can receive online training from ADL coaches, or if your school has more than 12 students, one of ADL coaches can go to your school to teach. Q: How can I help recruit more schools? Click to see pictures of 2014 NSDA-Taiwan Tournament. Q: How do I pay for this event? For your convenience, all fees can be wired to ADL account directly before April 9, and ADL can wire the total sum to the NSDA. ADL Judging fee – NT$ 4,000 (This fee is waived, if you bring your own judge. 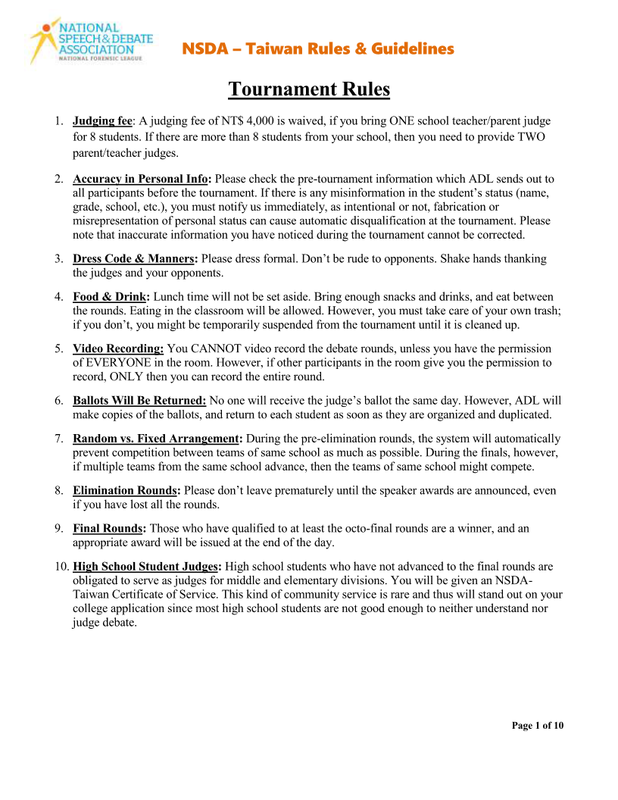 If you you have more than 8 students, then need to bring 2 parent/teacher judges). As of now, we have 11 high schools confirmed and submitted entries, but not all of them paid NSDA student and/or school membership. For each of the below event, we need a minimum of 5 entries from a minimum of 2 different schools; otherwise, the event will be cancelled. **Middle and High School Original Oratory events will be merged, but middle school won’t be qualified. **Middle and High School Policy events will be merged, but middle school won’t be qualified. Parliamentary Debate: Qualifies 6 Students to World Schools Debate Invitational WSD. If you want to do two events, make sure you choose either time block A or B, but you cannot mix events from different time blocks. Q: How do I prepare for Elementary Events? 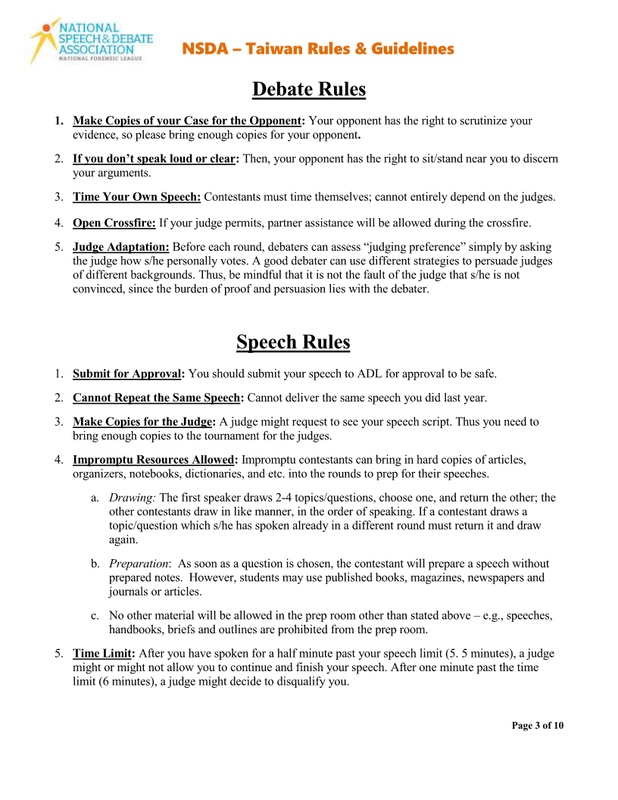 4.Smart Debate:This is 1/2 the time of public forum debate, thus manageable for younger and beginning debate students. 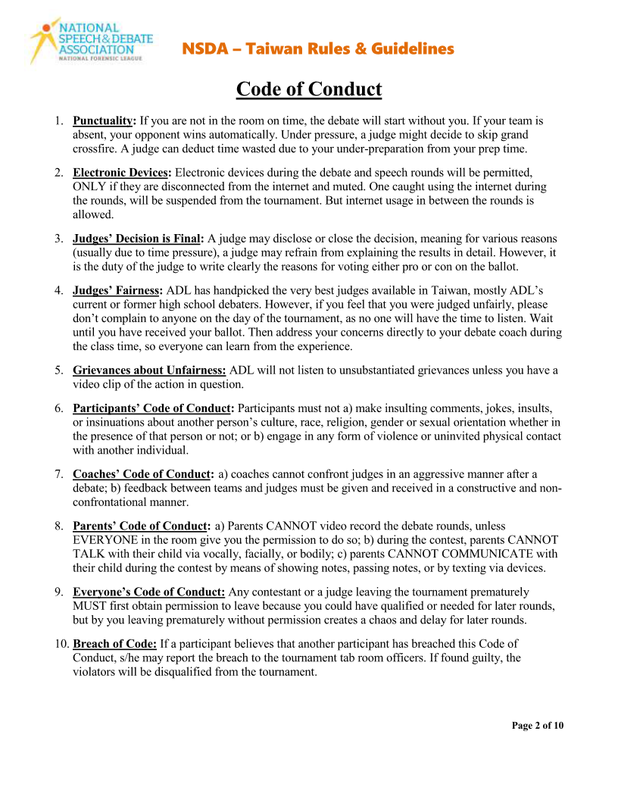 Successful smart debaters must make persuasive and logical arguments in a manner that is accessible to a wide variety of audiences.